J.E.E.P club members at a previous group ride. On February 11th, Just Empty Each Pocket (J.E.E.P) group of Southern Ohio will have a Valentine’s Day ride beginning at noon. Just Empty Each Pocket (J.E.E.P) asks that those participating in the ride bring a small stuffed Valentine toy, to be donated to the Children’s Service Group on Valentine’s Day. The ride will start at US 23 & Rt. #2 in Greenup, KY at the Goodwill parking lot, and will then travel Rt.# 2 to Carter Caves and enjoy the Lunch Buffet. Anyone with a Jeep is welcome to join in on the ride, non-members also welcome with the donation of small stuffed toy. Founder Steve Hileman, of Just Empty Each Pocket (J.E.E.P), welcomes any questions about the event and directs those interested in participating in the Valentine’s Day ride or the club in general, to the group’s Facebook page. 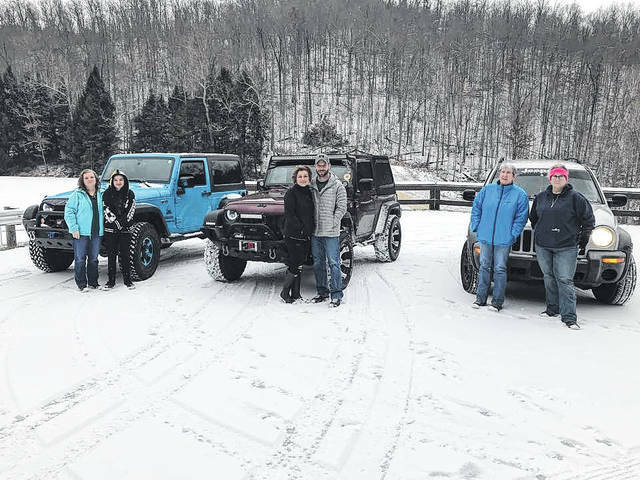 Just Empty Each Pocket is a group that celebrates a love of Jeeps, trail riding, making friends in the Jeep community, and having good times with people of similar interests and is proud to welcome new members with no club fees. The J.E.E.P club is sponsored by the Glockner Family Dealership.